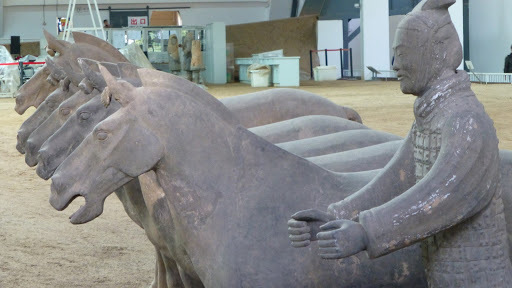 Of course the main event in Xian is a visit to see the Terracotta Warriors. And we were suitably awe-struck! What an incredible place, and fascinating to ponder the history here. It’s really hard to believe that in 1974 a bunch of farmers were trying to dig a well in a field and hit upon some broken pieces of pottery and alerted the local village leader. The government sectioned off the area and had archeologists dig around, and they came across the most amazing discovery. 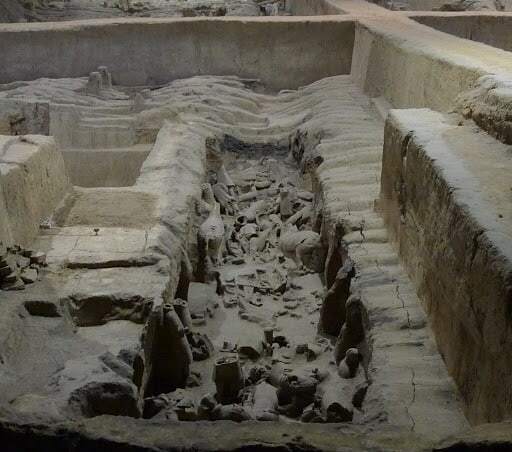 What they found was the ancient burial-site of the first Chinese Emperor Qin Shihuangdi. 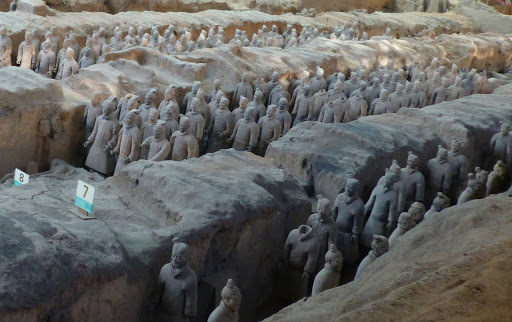 These warriors were placed all around the burial tomb of Emperor Qin to protect him. 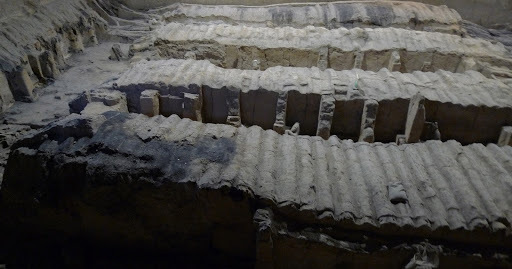 The soldiers were found arranged in military formation in 4 large pits with rammed earth walls dividing the rows. 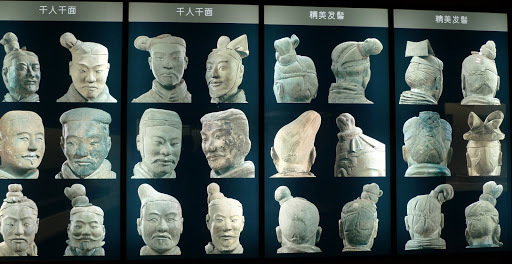 The face of each Warrior was created in the likeness of an actual soldier. No face alike. 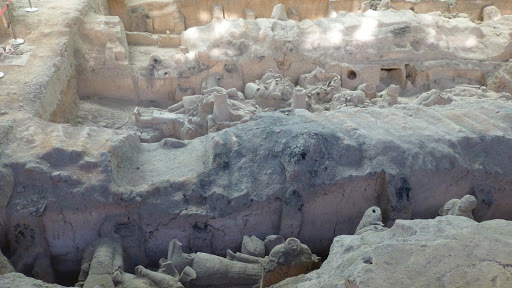 The figures were made using molds for different pieces, which were then assembled. Although the statues were originally brightly painted, the paint has since mostly flaked away. 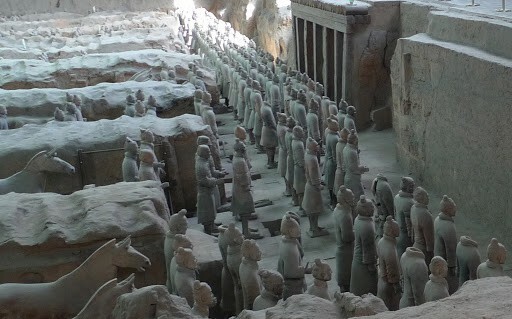 The “army” is made up of more than 6,000 figures including soldiers, horses, chariots, bowmen and archers. The figures are life-sized, and each has a unique face and details. 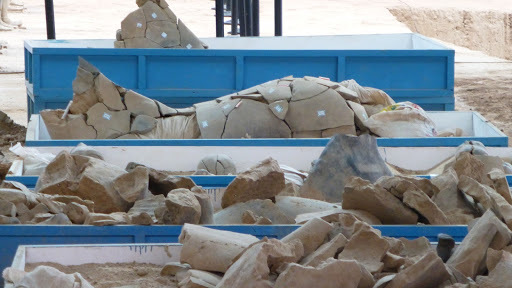 Still more to be unearthed. The site attracts an estimated 2 million visitors each year, fortunately for us they weren’t all there on the day of our visit.There was actually plenty of space for us to move around freely. You can see that sign there in the middle, showing the spot where the farmers started to dig. Lots of work still to go, probably decades. 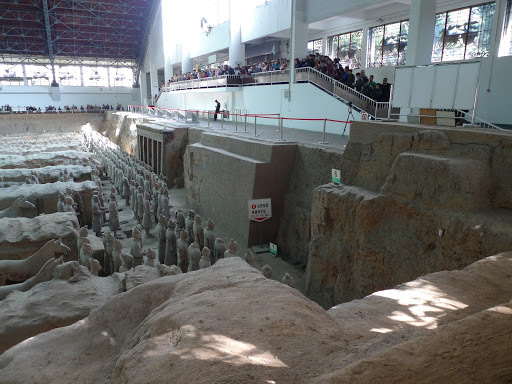 The tomb of the Terracotta Army was designated a UNESCO World Heritage site in 1987. 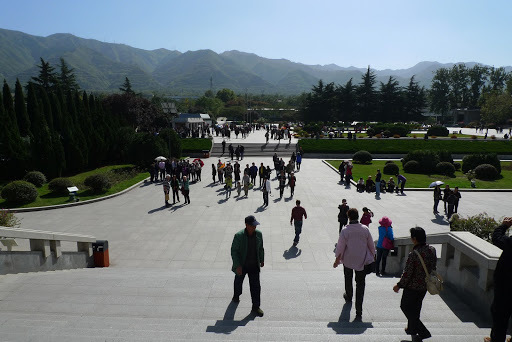 Throughout our time in China, we’d been given lots of positive reinforcements about the efforts of the Cultural Revolution, and usually from the perspective of those born after China opened up. So when our local guide collected us from the hotel to take us to see the Warriors, we were very excited to find that she grew up in the Mao generation, and she gave us a brief version of her life during that time. Fascinating to hear first hand of some real stories. She told us that her family had owned property which was taken away and distributed, leaving them in poverty. She also told us how she, her sister and brother were all ridiculed and bullied at school for being “aristocrats”. 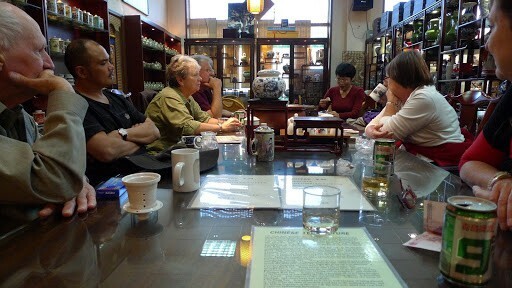 After visiting the museum we had another opportunity to sample local teas, and we all enjoyed each others’ company, together with our guide, to relax and talk. The gardens and surrounding structures are very beautifully set out, and it was a perfect day to visit. 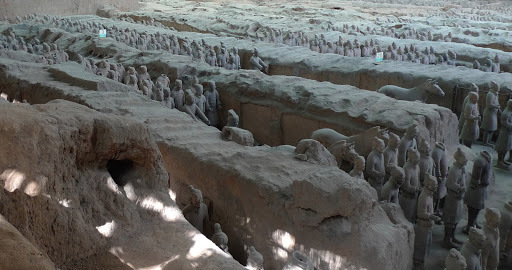 Visiting the Terracotta Warriors was a true highlight of our Intrepid Travel Grand China trip, and I’m so glad to have had the opportunity to experience the enormity of it all. A not-so-great story from the Xian segment of our trip is our travel companion Stan’s too-close brush with the Chinese public health system. It would be an understatement to say that both Stan and Kay found their experience traumatic. 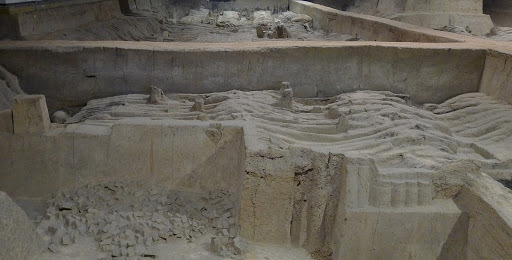 I’ll expand on that a bit more on that next time, as well I’ll be sharing a really lovely story of our visit to Xian Hui Ling.